Powerful enough to contain a mythical Minotaur, yet a serene tool for personal and spiritual quests, the labyrinth has retained its mystical sense since ancient times. For centuries people have found solace walking the single-path symbol of power and peace. 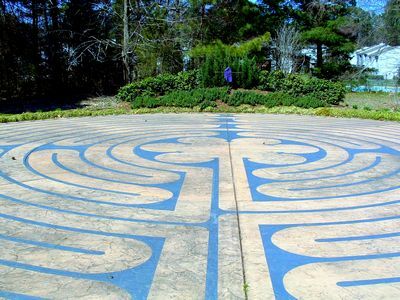 Travelers on a spirit quest, or just curious, may want to add a labyrinth walk to their itinerary, especially since North Carolina has many different types of labyrinths scattered about the state. Walking a labyrinth is a personal journey and everyone does it for their own reasons. While there are no set rules on how to do it, there are suggested guidelines to help you make the most of your labyrinth experience. They are similar, yet vary. It’s really up to you to decide. The routine below is my preferred way. Prior to the walk, sit or stand for a bit and take the energy in. 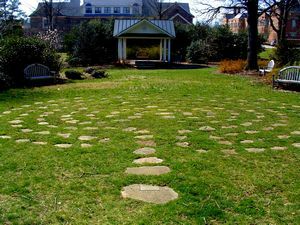 If you go with a specific question or issue, put it out there and take a breath before entering the labyrinth. As you enter, allow negativity drain from your body, and let your mind to clear. Focus on breathing and cleaning out negativity as you move along the path. When you reach the center, stay for at least a moment, preferably longer, to allow answers, comfort, inspiration, messages or thoughts to enter your mind. Don’t worry if nothing seems to come, and don’t try to force it. Some people find that praying in the center helps too. Leave the center when you feel the urge and start on the return path. As you walk your return. Take in the goodness of the ground beneath your feet. Feel the good energy rise upward through you with each step. After you exit, take some time to reflect on your experience. As a courtesy, if other people are walking the labyrinth when you do, keep quiet and pass with care. Respect the quest of other walkers as you expect them to do for you. Below is a sampling of public, no fee labyrinths in the Raleigh Durham area. Chapel Hill: The Church of Reconciliation, Elliott Road: Rock, Classical Labyrinth located behind the Education building. Always open. Durham: St. Philips Episcopal Church, E. Main Street: Brick Labyrinth. Open M-F 9 – 4:30, Sundays, and special days when church is open. Raleigh: St. Michael’s Episcopal Church, Canterbury Road: Brick, Medieval Labyrinth. Always open. Raleigh: Millbrook Baptist Church, Millbrook Road. Paved concrete, Medieval Chartres style Labyrinth. Always open. Rougemont: New Bethel United Methodist Church. Rock Labyrinth (could use some TLC). Always open. Wake Forest: Grace Haven Baptist Fellowship. Rock (white quartz stone & mulch), Medieval, Santa Rosa Labyrinth.